Spanish defence and space contractor Tecnobit has used boundary scan testing for over 10 years, to maximise test coverage and speed up throughput. The company’s engineers understand boundary scan equipment, and recently invested in XJTAG for its combination of outstanding functionality, competitive pricing and superior technical support compared with other leading systems. 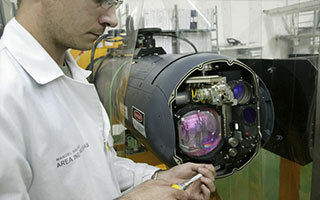 The Eurofighter FLIR boards contain a microprocessor embedded in an FPGA, which has large numbers of BGA I/Os that cannot be inspected visually or tested using probes or an in-circuit fixture. Boundary scan can test these connections, and also verifies the connectivity and functionality of other devices on the board such as SDRAM and Flash memories, Ethernet chips, and A-to-D or D-to-A converters. “We evaluated most of the leading systems on the market, and found XJTAG to be the winner for a number of reasons”, continues David Moreno. “It offers all the features we need, matching or exceeding the others, but at a better price. We have also found XJTAG’s technical support to be the most accessible and responsive.” High-quality technical support is particularly important for companies needing help to develop specialised or custom tests, or those new to boundary scan testing. Tecnobit is planning to integrate boundary scan with its own custom functional test equipment. Having developed a boundary scan module incorporating XJTAG components, engineers expect to achieve a compact solution combining both roles in a 19-inch rack-mount enclosure. XJTAG provides several features that assist integration with other equipment. These include the XJAPI Application Programming Interface as well as USB-to-JTAG and PXI-to-JTAG hardware, which provide low-level access to the boundary scan chain. XJTAG’s standard Component Object Model (COM) interface enables integration with test executives such as National Instruments LabVIEW™ or LabWindows™/CVI. David Moreno continues, “We also use the XJTAG system to speed up verification of new designs, taking advantage of several built-in features. The Advanced Connection Test reaches a high percentage of connections on each board, and describes the position and nature of faults, while automatic DFT Analysis helps to reach high targets for test coverage”. In addition, XJTAG’s high-level test description language and unique device-centric approach speeds up test engineering and promotes test re-use in other projects. We evaluated most of the leading systems on the market, and found XJTAG to be the winner for a number of reasons. It offers all the features we need, matching or exceeding the others, but at a better price. XJTAG’s technical support is the most accessible and responsive. The XJTAG system helps us identify and repair many faults before functional test, and we also use it to verify new designs quickly. In practice, XJTAG is the most cost-effective way for us to increase test coverage and speed up fault finding and repair using boundary scan. Tecnobit, established in 1985, builds professional equipment including avionics, optronics, naval command and control systems, simulation equipment and a variety of tactical communication and information systems for customers across Europe and worldwide.